Google released a new mobile application called Google Currents few days back. Google Currents, a free mobile application, is an attempt by Google to offer beautiful contents in an easily accessible way. If you have ever used Flipboard on iPad or iPhone, Google Currents is basically a take on it by Google to provide great contents for great audience. Basically it lets us explore online magazines and other contents from Internet in a beautiful interface, creating a personal magazine stores that travels with you. Google Current is available for both Android (obviously!) and iOS. You can download the app for iPhone or iPad from the App Store for free. After download, you are required to sign in to the app using your Google ID. 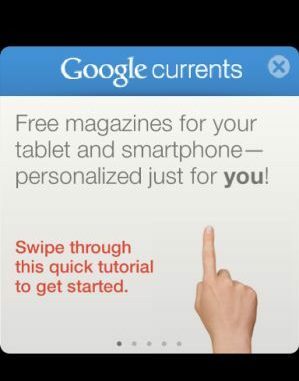 To give you a better experience with Google Currents, it walks you through a brief tutorial when you first launch it. Once that is over, you will be taken to a clean, uncluttered interface, so much similar to what we have seen in many of the Google Web apps, such as Gmail, Google Docs, etc. Google Current comes with few free magazines, such as Forbes, already added in your library. You can get more magazines by tapping on the Add More icon on the next page and subscribe it for free. Another good thing about Google Current is that, in addition to online magazines, you can also add RSS feeds and other Google Reader subscriptions you may be already following. You can subscribe to 100s of online magazines which are specially optimized for smart phones, both iOS and Android, from the Google Current Library, by tapping on the tile with a plus icon. You can also add your already subscribed RSS feeds by going to Library >> Google Reader and simply by tapping Add on any your subscriptions. I love the clean, uncluttered interface of Google Current, which makes reading and viewing images so much pleasing to the eyes. It also automatically paginate each article and also create a table of contents. The articles can be set to automatically sync for you to read it even when you are offline. You get more options when your turn your iOS device into landscape mode, such as the ability to flip through the library on one half of the screen and see other news or articles on the other half. We can switch to an article by simply tapping on the screen and read it full screen. In addition to Library tab, there is a tab named “Trending”, as the name says, it shows hot news and articles from the Internet. If you tap again (or double tap) on the “Trending” tab, it will take us to a page to customize the news that appears under this list. Similarly, double tapping on the “Library” tab will directly take us to the Library where we can subscribe or unsubscribe our selections. Google Currents can be a cause to worry for Flipboard, heralded as the iPad App of the Year in 2010. Great advantage of Currents compared to Flipboard is that it was released for more mobile devices from the start itself, unlike Flipboard. Flipboard released its iPhone version only recently, missing out reaching millions of iPhone users. This makes the competition interesting for us, the consumers. You can download Google Currents from App Store for free, by clicking here. As of now, Currents is only available in the US App Store. Read this to know how you can download Google Currents and many other apps only available in US App Store.